Budi Karya Enterprise is professional supplier of cleaning tools and cleaning material. 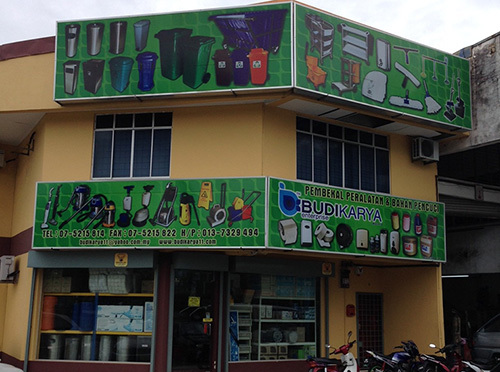 We are located at Kangkar Pulai, Johor. We distribute all kind of cleaning tools and cleaning material to all industry, department store, shops, offices and others. The products we supply include washroom fitting and equipments, polyethylence and fibre glass bins, stainless steel bin, and others cleaning materials and tools. Budi Karya Enterprise aims to deliver the best cleaning product quality and the best after sale services to all our clients. We recognize customer's need and fill them with our unique and value added package products. We also promise to offer the reasonable and affordable price for every order. Beside offering cleaning products, we are providing suggestion to your cleaning problems. According to your problems, our experienced people will suggest you the best solution of cleaning material to solve your problems. Please kindly to contact us for your enquiry. Our people are always ready to serve you and provide appropriate solution to you. "We deliver Cleaning solution of your Needs!"